What type of singer do you want to be? Many people dream of being a singer. Visions of Celine Dion captivating an audience as she hits the high “D” in a heart-wrenching version of “My Heart Will Go On: Theme from Titanic” dance in our heads like a vision from Heaven. Life on the road, touring across the country, or catching the next flight to Ireland for a tour in another country is also appealing. If you have singing talent, all of this is possible for you. And while you may not reach the level of fame Celine Dion has found, you may enjoy a singing career if the career is right for you. But, glamor aside, what does it take to become a singer? It depends on how far you want to go with it. But here are some basis steps one could take to launch their singing career. To be a singer, first consider the fact that some of this is a gift, a rare talent, to be able to cast a spell on the audience, the way Celine does, with just her voice. There’ve been many other great singers who could do this too, in all genres of music. But if you really want to make singing your career, you first need to consider what arena you want to sing primarily. For example, recording artists (like Celine and others) make their money from recordings, CD’s, mp3s they sell online, and tours, as well as all of the “hype” that goes with it. For example, they get a huge percentage of any T-shirt sales, memorabilia, and other merchandise sold during their tours, or in-store purchases, as well as online. So the money is huge, if you make it big. But that is a very difficult task to achieve. If you want to be a “stage singer,” the “big time” there would be performing on Broadway in a famous play or musical. These performers are also paid very well and can become famous quickly due to the high exposure the Broadway stage brings. Some choose just to sing as a “hobby,” but if you really want to pursue it as a career, and go all the way, you generally need at least some formal training (though this is not required). But it would always give you a “leg up” against the competition if you had a degree in Music/Voice or at least took some voice lessons from a seasoned professional. (We are assuming here that someone wishes to make it big as a professional singer for purposes of this informational article.) 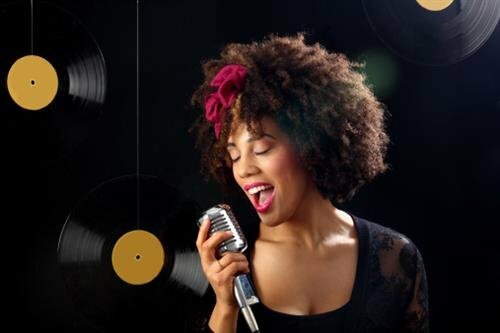 Courses dealing with both vocal and instrumental skills may also increase your chances of success. Someone wishing to pursue a career in singing should consider getting either a 4-year or a 2-year degree from an accredited college or art school in the area of Vocal Music. This education will concentrate on developing your vocal range, specific techniques in pitch and control, and other skills that may improve your ability as a singer. Alternately, you could take voice lessons from a reputable school and not worry about the degree. The bottom line is: Do you have marketable talent? If you do, get as much education in the field of Vocal Music as you can, participate in choirs at your church and other opportunities, and enter voice contests. Olivia Newton-John, the sweet Australian “girl next door” singer who later took the world by storm, starting in Nashville, got her opportunity when she and 2 friends from college entered a singing contest. There are lots of opportunities around if you know where to look. It also helps to be able to do more than just sing. Many singers have made it big because they could also write original songs, play the guitar, and multiple instruments. So make yourself as versatile as possible by increasing your ability in instrumental or composing too and it will increase your chances. 1) Practice your skill–EVERY DAY. The old adage “Practice makes perfect,” still works. While there is no “perfect” in the artistic careers, it is also true that the more you do it, the better you get. Someone will raw talent will “find their voice” and style, sometimes on their own, if they have enough time to work on their craft. 2) Focus on “originality.” Think of any singer who has made it big and you’ll say as you hear them sing, “I know who THAT is!” Unless they are a brand new talent recently unleashed on the world, we recognize them for their unique style of voice, perhaps the arrangement of their band, and other identifying qualities. So, no matter what you learn in college about singing, make your vocal style unique. No one can sing “My Heart Will Go On” like Celine Dion. Make your song your own and you’ll get noticed. 3) Get an agent. Just like in the Acting profession, once you decide to go for the gold, it is important to have someone working for you who has as much interest in your success as you do. An agent typically gets 10%, but 10% of 90% of something is better than 100% of nothing. If you have an agent, they will also work to get you more “gigs” which will increase your exposure. 4) Have a plan. Just as a corporation has a “business plan,” you should have a plan to reach your goals as a singer. One month you may focus on PR, the next on creating new songs, having a songwriting content, or other ventures. So outline a plan, but be open to change. 5) Join ASCAP (American Society of Composers and Performers). Especially if you write your own songs, this organization looks out for the interests of songwriters and musicians, and often connects you to professionals in the business. It also protects your rights on the internet and other venues from people pirating your music or reselling without legal permission. Here is the link for more information on ASCAP and one to BMI (another music royalty organization) that leads the industry and is a good resource for singers and musicians. There are many roads to becoming a singer, and many levels you could strive to achieve. How far you want to go with it, will determine the path you should take, and what you should focus on in the long run. Best of luck in your singing career, and may you stun audiences in ways Celine Dion only dreamed!